Luckily, Lea, Michelle, and I arrived at Ginkakuji just before it started raining, and the rain that fell while we were there was ‘atmospheric.’ In fact, we were in for a lot of ‘atmosphere’ during our day in Kyoto, but it didn’t really matter because Kyoto is one of those cities that’s just as beautiful in the rain as it is in any other weather. 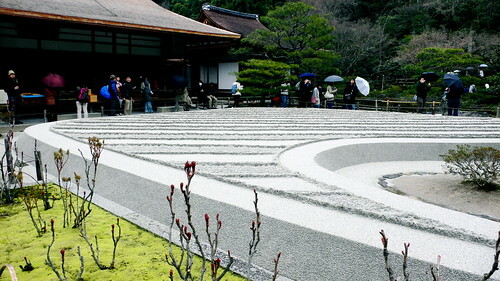 Ginkakuji, which is officially called Jishoji, is often referred to as the “Silver Pavilion” in English. 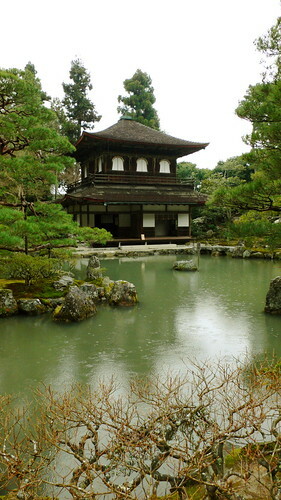 It’s the sister site of Kinkakuji and was built by Yoshimitsu’s son, Yoshimasa, in homage to his father. Yoshimasa originally intended to coat the outside of the temple in silver, just as Kinkakuji is coated in gold, but the financial constraints of the Onin War, which his bad decisions are credited with starting, made this an impossibility. The temple became a mountain retreat for Yoshimasa who, as I understand it, didn’t do much as a Shogun, but contributed greatly to Japanese culture. 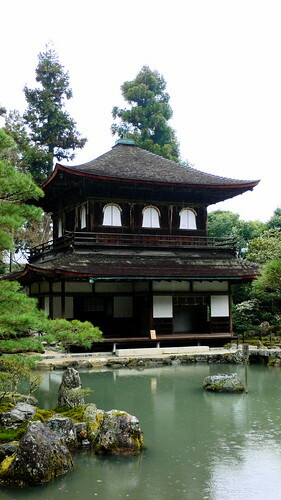 While the Onin War raged outside, Yoshimasa retreated inside the walls of Ginkakuji where he was a patron of the arts. Large parts of the actual city of Kyoto were destroyed during the ten years of the Onin War, but at Ginkakuji the arts of the tea ceremony, Noh, sumi-e painting, and ikebana reached new heights during the period of Higashiyama culture. 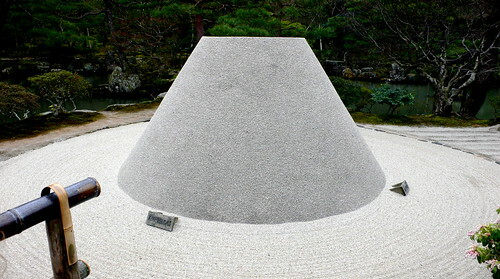 This is the Kougetsudai mound of Ginkakuji’s famous sand garden. It represents Mt. Fuji and is supposed to be most beautiful in the moonlight. Here’s as much of the Ginsyadan as I could fit into the photograph — even with a relatively wide-angle 28mm lens. 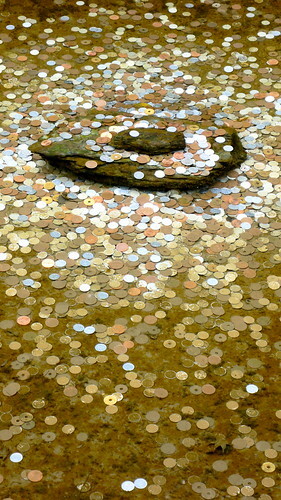 The Ginsyadan represents the sea, and the arc of its furthest arm reaches out toward the Kougetsudai. 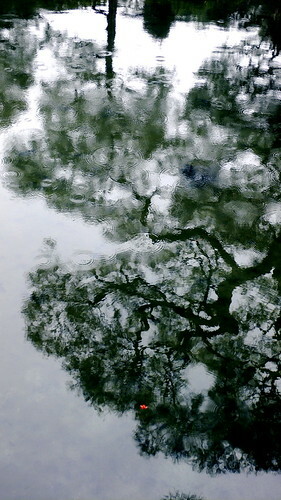 Reflections on the waters of Ginkakuji’s pond. Ginkakuji’s garden, which is often considered one of the most beautiful in Japan, climbs up on the mountainside behind the temple complex. 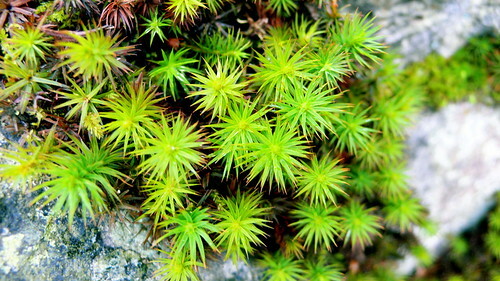 Much of this garden’s effect is achieved via the suprising miniature landscapes formed by moss and stone that can be found everywhere along the walking path. 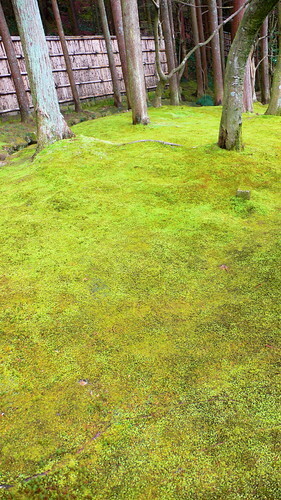 There are probably at least a dozen different kinds of moss at Ginkakuji. Almost the entire garden area at Ginkakuji is covered with moss, which is meticulously raked to keep it aerated, and free from dead leaves and debries. A final view of Ginkakuji. It was at this point that the rain really started to come down.